We need women of science on screen – in major summer blockbusters working together to discover, empower, and save the world. As Ghostbusters’ male ‘evil scientist’ exclaims “do it in the right place, with enough power, and there goes the barrier!” – he’s talking about releasing supernatural creatures on New York but it works for Ghostbusters too as it pushes at the gender barrier. It puts at least a small crack in the glass ceiling by showing that these “sisters in science” are what scientists can and do look like. By normalising women of science on screen and by having them as lead characters rather than sci-candy sidekicks the film industry can show that being a scientist is an entirely achievable goal for the young woman looking to her future career. Alongside the funny, brilliant white women of science, Ghostbusters could should have included of a scientist who was a woman of colour. Negative stereotypes may help to explain why fewer women and people of colour work at the higher levels of the STEM fields. Showing that science is for everyone is important. We need films like Ghostbusters to show diverse female characters with notably different personalities in the types of stories that have so frequently been dominated by men. Upcoming films like the biopic Hidden Figures(2016), which tells the story of black women scientists who worked at NASA in its formative years, will begin to open up the stories told about women of science but it needs happen across a range of genres including science fiction comedy. 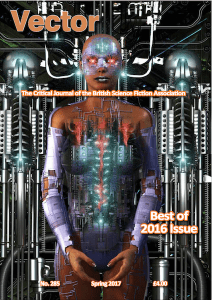 This review originally appeared in Vector: The Critical Journal of the British Science Fiction Association in their ‘Best of 2016’ edition published Spring 2017. Citation: Chambers, Amy C., 2017. Ghostbusters (Paul Feig, US 2016) [review]. Vector: The Critical Journal of the British Science Fiction Association 285, pp.12-13.